artisan bread in 5 mins? Amazing! I've always hesitate to make bread cos of the proofing time. Perhaps I should give this a try soon. Artisan bread in 5, teh ultimate bread book for hassle free baking! Your loaf looks wonderful! Thank you so much for trying the recipe and sharing it with your readers. Please come visit us at www.artisanbreadinfive.com. This week we are giving away 2 books because it is the anniversary of the book coming out! I have been working through this book for months now, and I love it! We have made a good number of things and have had very good and delicous luck. I LOVE this book and use it all the time. 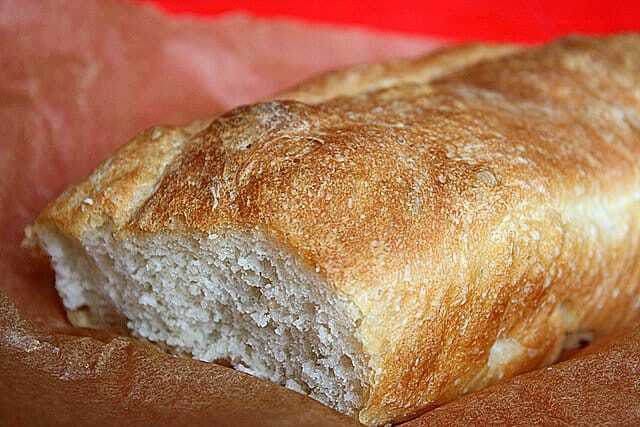 It makes the best bread ever and it is so easy! I know how to make bread the slow way but I hardly ever do it anymore because we like this bread so much better. Wow! I definately have to try it. SO EASY! K-man: yes, I did eat it with curry! Didally: some proofing time is still needed to let bread rise before baking but at least there's no kneading involved! Southernoise: ha, many thanks to you! I wish I tried this earlier! Zoe! Thanks for dropping by. I linked to artisanbreadinfive but I will check out your own Zoebakes site. 独孤求胜, diva, K8, Mrs Mordecai, Manuela: thank you all for your encouraging comments! Yeah, now I don't know what to do with my regular bread-baking books! I can't wait to try this bread out as its pretty similar to the no knead bread. I like the idea where you can let the dough sit in the fridge for a long time. Thanks for sharing.